Passme devices : EZ Pass 2 for NDS - SHOP01MEDIA - console accessories and mods, retro, shop - One Stop Shop! Original accessory for EZ Flash. Universal model, works with all flash carts and NDS! *** STOCK CLEARANCE *** 1 month warraty. Original accessory for EZ Flash. 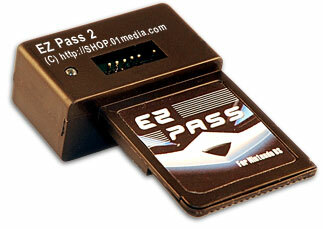 Universal model, works with all flash carts and NDS!EZ Pass 2 offers same functionality as PassKey 2 / Superpass 2 etc. You need it to start backups of commercial NDS games from NDS with a flash kit. EZ Pass 2 is recomended specially for all EZ Flash users (but it works with other brands as well). The EZ Client softaware offers special choice for NDSloader and PASSME2 which makes it more easy to use. EZ Pass 2 - review and user guide.